Sheikh Jarrah neighborhood. In the background, the city center of Jerusalem. 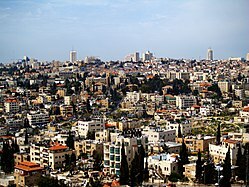 Sheikh Jarrah (Arabic: الشيخ جراح‎, Hebrew: שייח' ג'ראח) is a predominantly Palestinian neighborhood in East Jerusalem, 2 kilometers north of the Old City, on the road to Mount Scopus. It received its name from the 13th-century tomb of Sheikh Jarrah, a physician of Saladin, located within its vicinity. The modern neighborhood was founded in 1865 and gradually became a residential center of Jerusalem's Muslim elite, particularly the al-Husayni family. After the 1948 Arab-Israeli War, it straddled the no-man's land area between Jordanian-held East Jerusalem and Israeli-held West Jerusalem until the neighborhood was occupied by Israel in the 1967 Six-Day War. It is currently the center of a number of property disputes between Palestinians and Israelis. Most of its present Palestinian population is said to come from refugees expelled from Jerusalem's Talbiya neighbourhood in 1948. The Arab neighborhood of Sheikh Jarrah was originally a village named after Hussam al-Din al-Jarrahi, who lived in the 12th century and was an emir and the personal physician to Saladin, the military leader whose army liberated Jerusalem from the Crusaders. Sheikh Hussam received the title jarrah (جراح), meaning "healer" or "surgeon" in Arabic. Sheikh Jarrah established a zawiya (literally "angle, corner", also meaning a small mosque or school), known as the Zawiya Jarrahiyya. Sheikh Jarrah was buried on the grounds of the school. A tomb was built in 1201, which became a destination for worshippers and visitors. A two-story stone building incorporating a flour mill, Qasr el-Amawi, was built opposite the tomb in the 17th century. The neighborhood Sheikh Jarrah was established on the slopes of Mount Scopus, taking its name from the tomb of Sheikh Jarrah. The initial residential construction works were commenced in 1865 by an important city notable, Rabah al-Husayni, who constructed a large manor among the olive groves near the Sheikh Jarrah tomb and outside the Damascus Gate. This action motivated many other Muslim notables from the Old City to migrate to the area and construct new homes, including the Nashashibis, built homes in the upscale northern and eastern parts of the neighborhood. Sheikh Jarrah began to grow as a Muslim nucleus between the 1870s and 1890s. Prayer at the Sheikh Jarrah tomb is said bring good luck, particularly for those who raise chickens and eggs. It became the first Arab Muslim-majority neighborhood in Jerusalem to be built outside the walls of the Old City. In the western part, houses were smaller and more scattered. Because it was founded by Rabah al-Husayni whose home formed the nucleus of Sheikh Jarrah, the neighborhood was locally referred to as the "Husayni Neighborhood." It gradually became a center for the notable al-Husayni family whose members, including Jerusalem mayor Salim al-Husayni and the former treasurer of the Education Ministry in the Ottoman capital of Istanbul, Shukri al-Husayni, built their residences in the neighborhood. Other notables who moved into the neighborhood included Faydi Efendi Shaykh Yunus, the Custodian of the Aqsa Mosque and the Dome of the Rock, and Rashid Efendi al-Nashashibi, a member of the District Administrative Council. A mosque housing the Sheikh Jarrah tomb was built in 1895 on Nablus Road, north of the Old City and the American Colony. In 1898 the Anglican St. George's School was built in Sheikh Jarrah and soon became the secondary educational institution where Jerusalem's elite sent their sons. At the Ottoman census of 1905, the Sheikh Jarrah nahiya (sub-district) consisted of the Muslim quarters of Sheikh Jarrah, Hayy el-Husayni, Wadi el-Joz and Bab ez-Zahira, and the Jewish quarters of Shim'on Hatsadik and Nahalat Shim'on. Its population was counted as 167 Muslim families (est. 1,250 people), 97 Jewish families, and 6 Christian families. It contained the largest concentration of Muslims outside the Old City. Most of the Muslim population was born in Jerusalem, with 185 residents alone being members of the al-Husayni family. A smaller number hailed from other parts of Palestine, namely Hebron, Jabal Nablus and Ramla, and from other parts of the Ottoman Empire, including Damascus, Beirut, Libya and Anatolia. The Jewish population included Ashkenazim, Sephardim and Maghrebin while the Christians were mostly Protestants. In 1918 the Sheikh Jarrah quarter of the Sheikh Jarrah nahiya contained about 30 houses. During the 1948 Arab–Israeli War, 14 April, 78 Jews, mostly doctors and nurses, were killed on their way to Hadassah Hospital when their convoy was attacked by Arab forces as it passed through Sheikh Jarrah, the main road to Mount Scopus. In the wake of these hostilities, Mount Scopus was cut off from West Jerusalem. On 24 April the Haganah launched an attack on Sheikh Jarrah as part of Operation Yevusi but they were forced to retreat after action by the British Army. From 1948, Sheikh Jarrah was on the edge of a UN-patrolled no-man's land between West Jerusalem and the Israeli enclave on Mount Scopus. A wall stretched from Sheikh Jarrah to Mandelbaum Gate, dividing the city. In 1956, the Jordanian government moved 28 Palestinian families into Sheikh Jarrah who were displaced from their homes in Israeli-held Jerusalem during the 1948 War. As permanent ownership transfer was illegal under the Fourth Geneva Convention, the area was placed under the jurisdiction of the Jordanian Custodian of Enemy Property. During the Six-Day War of 1967, Israel captured East Jerusalem, including Sheikh Jarrah. In 1972, the Sephardic Community Committee and the Knesset Yisrael Committee went to court to reclaim their property in the neighborhood. In 1982, they demanded rent for this property and the Supreme Court of Israel ruled in their favor. The tenants were allowed to remain as long as they paid rent. In the 1960s, many diplomatic missions and consulates opened in Sheikh Jarrah: The British Consulate at 19 Nashashibi Street, the Turkish Consulate next door at 20 Nashashibi Street, the Belgian Consulate, the Swedish Consulate, the Spanish Consulate, and the UN mission at Saint George Street. Tony Blair, envoy of the Diplomatic Quartet, stays at the American Colony Hotel when visiting the region. The neighbourhood's main street, Nablus Road, was previously part of route 60. In the 1990s a new dual carriageway with two lanes in each direction and a separate bus lane was built west of the neighborhood. Tracks were laid in the busway which since 2010 form the Red Line of the Jerusalem Light Rail. Jewish groups have sought to gain property in Sheikh Jarrah that they say were once owned by Jews, including the Shepherd Hotel compound, the Mufti's Vineyard, the building of the el-Ma'amuniya school, the Simeon the Just/Shimon HaTzadik compound, and the Nahlat Shimon neighborhood. In 2001, Israeli settlers moved into a sealed section of the al-Kurd family's house and refused to leave, claiming the property was owned by Jews. In 2008, the Jerusalem District Court ruled that the Shimon Hatzadik property belonged to the Sephardi Community Committee. The Arab families had protected tenant status as long as they paid rent but several families refused to pay, ending in their eviction. The al-Kurds were evicted in November 2008. Muhammad al-Kurd, the head of the family, died eleven days later. The court ruling was based on an Ottoman-era bill of sale whose authenticity was challenged in 2009 on the grounds that the building had only been rented to the Sephardi group. Fawzieh al-Kurd continued to protest the eviction, moving into an encampment in East Jerusalem. Lawyers for the Jewish families argued that documents from the Ottoman Empire originally used to prove that a Jewish Sephardic organization had purchased the land in question in the 19th century are indeed valid, while Palestinian lawyers brought with them documents from Istanbul's Ottoman archives indicating that the Jewish organization that claims to own the land only rented it, and as such was not the rightful owner, the Kurd family claims that when they pressed the court to look at the new evidence, they were told "it's too late". Moreover, the Palestinian families and their supporters maintained that Ottoman documents that Israel's Supreme Court had validated were in fact forgeries, and that the original ruling and therefore evictions relating to that ruling should be reversed. The lawyer for the Israeli families emphasized that the land deeds were authentic, according to many Israeli courts The Israeli court decision (resulting in the aforementioned evictions) stated that the document presented by the Palestinian families was a forgery, while the document of Jewish ownership was authentic. In August 2009, the court evicted the al-Hanoun and al-Ghawi families from two homes in Sheikh Jarrah and Jewish families moved in based on a Supreme Court ruling that the property was owned by Jews. The United Nations coordinator for the Middle East Peace Process, Robert Serry condemned the decision: "These actions heighten tensions and undermine international efforts to create conditions for fruitful negotiations to achieve peace." The US State Department called it a violation of Israel's obligations under the Road map for peace. Palestinian negotiator Saeb Erekat said "Tonight, while these new settlers from abroad will be accommodating themselves and their belongings in these Palestinian houses, 19 newly homeless children will have nowhere to sleep." Yakir Segev of the Jerusalem municipal council responded: "This is a matter of the court. It is a civil dispute between Palestinian families and those of Israeli settlers, regarding who is the rightful owner of this property... Israeli law is the only law we are obliged to obey." The Jewish presence in Sheikh Jarrah centered on the tomb of Shimon HaTzadik, one of the last members of the Great Assembly, the governing body of the Jewish people after the Babylonian Exile. According to the Babylonian Talmud, Shimon HaTzadik met with Alexander the Great when the Macedonian army passed through the Land of Israel and convinced him not to destroy the Second Temple. For years Jews made pilgrimages to his tomb in Sheikh Jarrah, a practice documented in travel literature. In 1876, the cave and the adjoining land, planted with 80 ancient olive trees, were purchased by the Jews for 15,000 francs. Dozens of Jewish families built homes on the property. Other landmarks in Sheikh Jarrah are a medieval mosque dedicated to one the soldiers of Saladin, St. George's Anglican Cathedral and the Tomb of the Kings. The St John of Jerusalem Eye Hospital is an institution of The Order of St John that provides eye care in the West Bank, Gaza and East Jerusalem. Patients receive care regardless of race, religion or ability to pay. The hospital first opened in 1882 on Hebron Road opposite Mount Zion. The building in Sheikh Jarrah opened in 1960 on Nashashibi Street. The St. Joseph's French Hospital is situated across the street from St John of Jerusalem Eye Hospital and is run by a French Catholic charity. It is a 73-bed hospital with three main operating theaters, coronary care unit, X-ray, laboratory facilities, and outpatient clinic. Facilities in internal medicine, surgery, neurosurgery, E.N.T., pediatric surgery and orthopedics. The Shepherd Hotel in Sheikh Jarrah was originally a villa built for the Grand Mufti of Jerusalem. The mufti, who never lived in it, transferred property rights to his personal secretary, George Antonius and his wife, Katy. After the death of George Antonius in 1942, his widow Katy invited many of Jerusalem's elite to her house, though only one Jew. While living in the house, Katy Antonius had a highly publicized affair with the commander of the British forces in Palestine, Evelyn Barker. In 1947, the Jewish underground Irgun blew up a house nearby. Antonius left the house, and a regiment of Scottish Highlanders was stationed there. After the 1948 war, it was taken over by the Jordanian authorities and turned into a pilgrim hotel. In 1985, it was bought by the American Jewish millionaire Irving Moskowitz and continued to operate as a hotel, renamed the Shefer Hotel. The Israeli border police used it as base for several years. In 2007, when Moskowitz initiated plans to build 122 apartments on the site of the hotel, the work was condemned by the British government. In 2009 the plan was modified, but was still condemned by the U.S. and U.K. governments, Permission to build 20 apartments near the hotel was given in 2009, and formal approval was announced by the Jerusalem municipality on March 23, 2010, hours before Prime Minister Benjamin Netanyahu met with President Barack Obama. The Haaretz reported that, "an existing structure in the area will be torn down to make room for the housing units, while the historic Shepherd Hotel will remain intact. A three-story parking structure and an access road will also be constructed on site." The hotel was finally demolished on January 9, 2011. Sheikh Jarrah is the subject of the 2012 documentary My Neighbourhood, co-directed by Julia Bacha and Rebekah Wingert-Jabi and co-produced by Just Vision and Al Jazeerah. ^ Neri Livneh, 'So What's It Like Being Called an Israel-hater?,' Haaretz 16 March 2010. ^ Marim Shahin (2005). Palestine: A Guide. Interlink Books. pp. 328–329. ISBN 1-56656-557-X. ^ Hawari, Mahmoud (2007). Ayyubid Jerusalem (1187-1250): an architectural and archaeological study (Illustrated ed.). Archaeopress. ISBN 9781407300429. ^ a b c d Ruth Kark and Shimon Landman, The establishment of Muslim neighbourhoods outside the Old City during the late Ottoman period, Palestine Exploration Quarterly, vol 112, 1980, pp 113–135. ^ Oesterreicher, John M.; Sinai, Anne (1974). Jerusalem (Illustrated ed.). John Day. p. 22. ISBN 9780381982669. ^ a b c d e f g Bussow, 2011, pp. 160-161. ^ a b Winter, Dave (1999). Israel handbook: with the Palestinian Authority areas (2nd, illustrated ed.). Footprint Travel Guides. p. 189. ISBN 9781900949484. ^ Bussow, 2011, p. 163. ^ Ma'oz, Moshe; Nusseibeh, Sari (2000). Jerusalem: Points of Friction, and Beyond (Illustrated ed.). BRILL. p. 143. ISBN 9789041188434. ^ a b c Adar Arnon, The quarters of Jerusalem in the Ottoman period, Middle Eastern Studies, vol. 28, 1992, pp 1–65. ^ Bussow, 2011, p. 162. ^ Shragai, Nadav (2009-07-27). "The Sheikh Jarrah-Shimon HaTzadik Neighborhood". Jerusalem Center for Public Affairs. ^ "Kai Bird's 'Gate': One Foot In Israel, One In Palestine". ^ Lidman, Melanie; Izenberg, Dan (29 September 2010). "Sheikh Jarrah Palestinians fear new evictions". The Jerusalem Post. Retrieved 12 May 2011. ^ a b Phillips, Melanie (2009-08-04). "The British decide that Israeli law is 'unacceptable'". The Spectator. Archived from the original on 2011-06-05. Retrieved 2009-08-30. ^ a b Elder, Akiva (2008-07-27). "U.S. protests eviction of Arab family from East Jerusalem home". Haaretz. ^ Levy, Gideon (2008-12-27). "Twilight Zone / Non-Jews need not apply". Haaretz. Archived from the original on 2009-04-16. Retrieved 2009-07-12. ^ a b c Hasson, Nir (2009-03-19). "Turkish documents prove Arabs own E. Jerusalem building". Haaretz. ^ "Ottoman Archives Show Land Deeds Forged By Jonathan Cook". ^ "High Court Evicts Arab Squatters in Jerusalem". ^ a b Palestinians evicted in Jerusalem BBC News. 2009-08-02. ^ 50 Palestinians evicted from Jerusalem homes Israeli police then allowed Jewish settlers to move into the houses MSNBC. 2009-08-02. ^ East Jerusalem evictions condemned Al-Jazeera English. Al-Jazeera and Agencies. 2009-08-02. ^ "Jerusalem Issue Briefs-The U.S.-Israeli Dispute over Building in Jerusalem: The Sheikh Jarrah-Shimon HaTzadik Neighborhood". 9 June 2010. Archived from the original on 9 June 2010. ^ "St John Eye Hospital – Improving Sight, Changing Lives". Retrieved January 23, 2011. ^ "St. Joseph's French Hospital - BioJerusalem". ^ New East Jerusalem homes approved hours before Netanyahu-Obama meet, Nir Hasson, Haaretz, March 23, 2010. ^ Matthew Lee (Jan 9, 2010). "Clinton slams Israeli demolition of historic hotel". Associated Press. Retrieved 8 January 2011. Bussow, Johann (2011). Hamidian Palestine: Politics and Society in the District of Jerusalem 1872-1908. BRILL. ISBN 9004205691. Yitzhak Reiter, Lior Lehrs (2010). The Sheikh Jarrah Affair: The Strategic Implications of Jewish Settlement in an Arab Neighborhood in East Jerusalem, JIIS Studies Series no. 404. The Jerusalem Institute for Israel Studies; On . This page was last edited on 7 November 2018, at 17:27 (UTC).